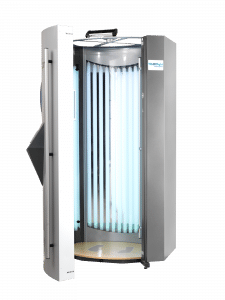 With the N-LINEpro, MEDlight has developed the state of the art full body cabin for UV phototherapy. A safe and reliable powerhouse that is everything you will ever want or need in a phototherapy cabin. Low running costs as the UV tubes last up to 500 hours, and can save up to 5,600 Euro per year in tube replacements. The high-end solution for professional full body treatments. Equipped with 40 powerful UV tubes this cabin supplies top-class efficiency and short therapy times. This proven design is the result of our extensive experience with phototherapy equipment. A highly accurate dosimetry system, the unique lamp arrangement, and an optimised oval cabin layout that matches the human body; this cabin is setting new standards. This state-of-the-art phototherapy cabin is designed to meet all your needs and requirements. The intelligent usability approach via an intuitive touch screen or an optional remote terminal makes treatments as efficient and convenient as possible. 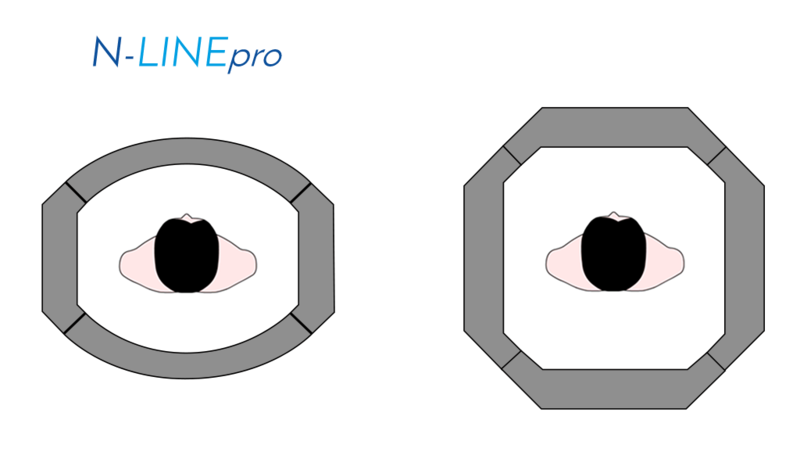 The geometry of the N-LINEpro cabin has been designed to ensure equal irradiation distances around the whole body. The N-LINEpro is equipped with 40 UVB (311 nm narrowband) or 40 PUVA tubes to achieve short therapy times. A combination of 20/20 is also possible. An innovative, unique dosage system continuously measures and surveys the interior of the cabin and equalises fluctuations of intensity. A quiet ventilation system offers a comfortable environment for the patient and optimises the operating temperature of the tubes. 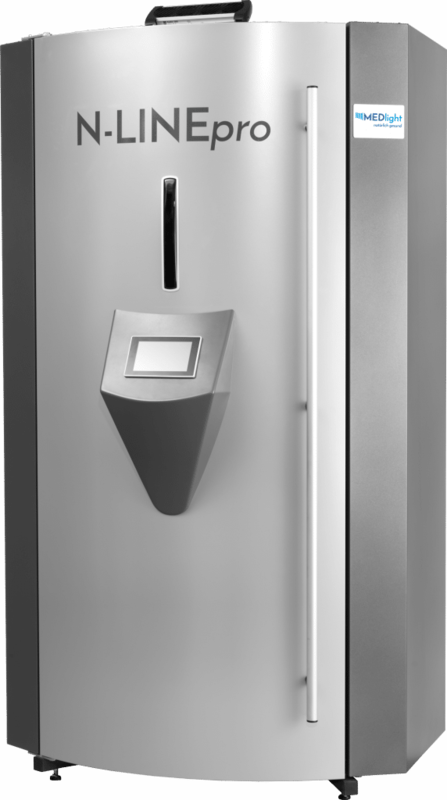 A modern touch screen allows for easy and intuitive operation. A PIN can be set to prevent unauthorized use of the cabin and further aspects for the patient’s safety were considered, e.g. a security cover in front of the tubes and an electrical door contact that immediately switches the cabin off should the patient open the door. Further options are available such as Remote control via LAN, video surveillance, patient intercom and SKINdex Software.